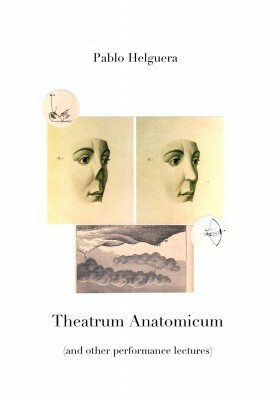 Theatrum Anatomicum (and Other Performance Lectures) brings together a number of performance scripts that blend the dramatic elements of theater with the format of the academic presentation, and bring into dialogue topics as disparate as the Latin American soap opera, the origins of the Kindergarten, the history of the Shakers, the US/Mexico war and the social dynamics of the art world. In these series of experimental works, the voices of real and fictional characters come together in a critical exploration of history, politics, and art. Over the last few years, the performance lecture has become a rather ubiquitous genre on the stages of highbrow museums and Brooklyn stand-up bars. Yet, as I realized while putting this collection of texts together, there is not a great deal of writing that discusses the nature and structure of the genre. This absence of a theoretical framework is somewhat liberating, because once something is theorized, it starts to get trapped in philosophical premises. But for this book I feel I have to define for myself, even if tentatively, what a performance lecture is—a task that has not yet been imposed upon me, despite the fact that I have doing such lectures since that evening in Chicago in 1993. The easy definition of a performance lecture is that it is a live presentation imparted by an artist who takes advantage of his or her artistic license and of the conventions of academic pedagogy to create a work that straddles fiction and reality. Irony and sometimes satire are central to the event: those who attend a performance lecture generally expect an irreverent take on academicism—a trait that explains this genre’s natural connection to institutional critique. Like other hybrid art genres, its very name illustrates the awkward juxtaposition of two modes of speaking that never entirely blend, much as prose poetry draws on the qualities of two different modes of writing without being entirely one or the other. Yet beyond these few points, performance lectures don’t follow many rules, and like performance, the genre is in a constant process of self-definition, sometimes delving into stand-up comedy, poetic presentations, recitals, speeches, etc. My work in museum education, begun in 1992 and continuing to this day, has required me to reflect constantly on the relationship between performativity and pedagogy that is inherent to performance lectures. Because of my involvement with performance and theater, I gravitated toward the public-programs area of museums—an area that for many years has been in serious need of revitalization. The lecture format, a seemingly necessary medium of communication and a vital staple of academia, is constantly reviled and declared dead today, and for good reasons. Ever since the publication of Donald A. Bligh’s What’s The Use of Lectures? in 1971, there was been a general awareness of the limitations of this educational format and yet very little done to innovate on it. Through the work of Bligh and others, we have repeatedly received prove that the lecture format is ineffective as a discussion method for promoting thought and that at best it is just as effective as other formats to transmit information, yet we continue to use this presentation formats that comes to us from the eighteenth century, a time when pedagogy consisted entirely of exposition and memorization. The limitations of this method become clearest with the practice of a “read paper”—usually consisting of a poorly delivered, hard-to-assimilate piece of writing that is best read at home by oneself. Academics who attend art conferences deride even their own presentations as boring and excessively long but continue to perpetuate these archaic models. However, I believe that this exasperation toward the traditional lecture format has finally reached the inner depths of the academic world, and in blogs and magazines, the lecture as we know it has been declared dead. A new type of lecture, the metalecture or lecture 2.0, must take its place. In my role as programmer, I have frequently been frustrated by the low or nonexistent public-speaking skills of those who lecture and participate in academic discussions. While featured speakers usually have something relevant to say (which is what prompts an invitation to speak), very few of them are skilled public speakers or comfortable in a public forum, which translates into stiffness and social awkwardness, insincerity, and a general reluctance to open up toward an audience. Because most lectures are based on a written text, their unfolding is slow and their language excessively formal and heavy for a live reading. Wouldn’t it be great, I thought, if panels were like theater works, where drama has its hand in conveying the message? I thought, why aren’t there be dramaturges for art lecturers?—and I set out to become one. Starting in about 1998 I started scripting stand-alone performance lectures. This eventually led to the incorporation of actors in symposia and panel discussions, which I first attempted in 2003 in collaboration with artist Ilana Boltvinik with The Congress of Urban Purification in Mexico City, and then again in 2004 at The First Imaginary Forum of Mental Sculpture at the Sculpture Center in Long Island City, Queens—both texts are included in this book. Not revealing the fact that actors were “interpreting” the papers and debates was key to maintaining the audience’s engagement without triggering the dismissal of the piece as yet another performance work. We All Are Streeter (2006), also included here, employed a similar theatrical strategy. Another trait of the traditional lecture format that interests me is the narrowness of thematic focus that often results from the demands of scholarship. While extremely specialized topics are the logical result of academic-type research, their presentation in the shape of a lecture before a general audience can be alienating and, even if comprehensible, it leaves the general spectator questioning the larger relevance of the subject at hand. This issue becomes more and more aggravated because while the lecture remains set in its traditional presentation style, twenty-first-century auditoriums are filled with a new generation of viewers whose brains are wired for multichannel experiences and are capable of processing and making sense of the daily deluge of information that technology now provides. Symposia and panel discussions are better opportunities for comparing perspectives on a given subject, but the patience and focus needed to sit through, say, a six-hour symposium, can only be mastered by diehards, in the same way that only an opera aficionado would sit through the entire Götterdämmerung. The slowness of the traditional academic lecture became even more apparent as the Internet and the digital revolution took hold. In this era of pingbacks and multichannel viewing and processing, it is normal that the most animated discussions take place online instead of in actual physical spaces. This was the motivation for works like Theatrum Anatomicum (P.S.1 Contemporary Art Center, New York, 2002) where I experimented with multichannel, “dueling” lectures about topics that were at first sight completely unrelated (such as twentieth-century Mexican telenovelas and seventeenth-century Dutch anatomical theaters) in order to shed light on both subjects and onto a larger umbrella topic.